Posted June 13, 2018 by Staff Writer & filed under Arts & Entertainment, Theatre & Performance. 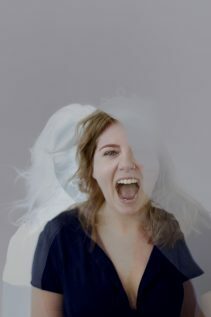 A new dark comedy, Air is premiering at the Old 505 Theatre to haunt audiences with the reality of death, grief, holding on and letting go. The story follows radio host, Annabel, who works the graveyard shift at a radio station and after the death of her father, finds herself reading death notices on air to an invisible audience. Then one morning the phone rings and she unintentionally spills the sorrows and secrets of an entire community, desperate to reconnect with her past. Despite being quite a dark performance, audiences will find humour embedded throughout the show and will share quite a few laughs.